The building of the theatre was designed by Carlo Rossi between 1828 and 1832. The main facade of the theatre is decorated with six columns of Corinthian style. They are installed on a high basement storey. The attic of the building is crowned with Apollo's chariot. Apollo is the patron of muses, the son of Zeus, the patron of poetry and the arts. Apollo is dressed in free-flowing clothes. He stands straight in a decorated chariot. In his raised right arm he holds a laurel wreath and a lyre in the left arm. The chariot of Apollo was modeled by the sculptor Stepan Pimenov. In the half-circular niches of the main facade there are the statues of two muses: Terpsichore and Melpomenae. Terpsichore was the muse of dance and Melpomenae was the muse of tragedy in Ancient Rome. On the other side of the building there are similar statues of Clio and Thalia. Clio was the muse of history and Thalia was the muse of comedy. This sculpture group is made of red brass and covered in bronze. The entire building is girded by a frieze of theatrical masks and garlands. Since its opening in 1832, the theatre was called the Alexandrinsky Theatre after Alexandra, the wife of Ni­cholas I. Alexandra played an outstanding part in the country’s public life. 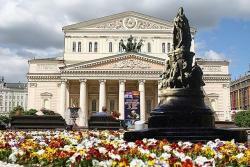 The first performance of the theatre was Kryukovsky’s historical drama “Prince Pozharsky”. The most famous actors of Russia performed on its stage. Such outstanding actors as Komissarzhevskaya, Savvina, Strepetova, Davydov were among them. In the centre of Ostrovsky Square in front of the Alexandrinsky Theatre there is a monument to Cathe­rine II. The monument was inaugurated in 1873. The author of the project was Mikhail Mikeshin. The figure of the empress was moulded by the sculptor Matvey Chizhov. The empress is depicted in an ermine mantle, holding a sceptre and a laurel wreath. Around the pedestal of the monument there are fig­ures of statesmen and military leaders of her time. There are general Alexander Suvorov, general Pyotr Ru­miantsev, state official Vasily Chichagov, chancellor Al­exander Bezborodko, educator Ivan Betskoy, poet Ga- vrila Derzhavin, writer Ekaterina Dashkova and gen­eral Alexey Orlov. On the front side of the monument there is Catherine’s favorite, Prince Grigory Potiomkin of Taurida. This political and military personage is modelled stepping on a Turkish turban. These sculp­tural representations of nine statesmen of Catherine II’s reign, were modeled by the sculptor Alexander Opekushin. All the personages were sculptured with portrait likeness. Over 1,200 8-metre piles were rammed in the ground when the monument was erected. The shrine with a lot of gold and silver coins and medals of the five tsars — Catherine II, Paul I, Alexander I, Nicholas I, Alexan­der II — was put in its basement. The statue of Cath­erine II is 4.35 metres high. It is almost twice as high as the other figures. The pedestal consists of 576 pieces of stone.